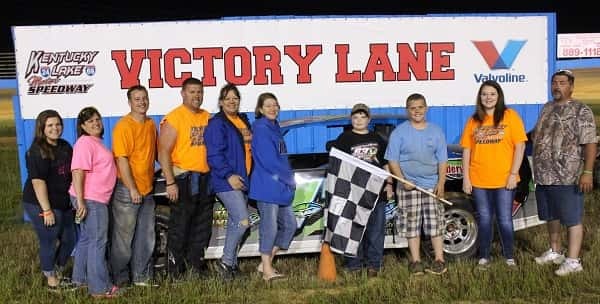 Tait Davenport won the 25-lap Crate Late Model feature Saturday at KLMS. 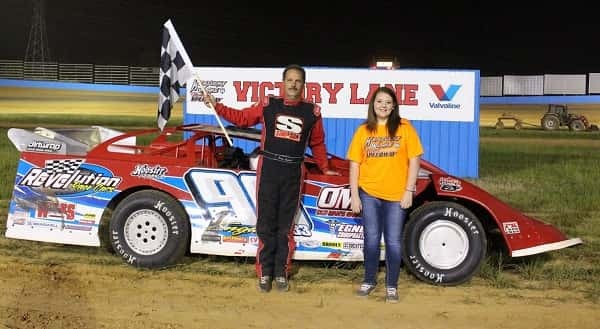 CALVERT CITY, Kentucky – Tait Davenport kept alive a winning streak, and snapped a five-week-long spell of inclement weather that had plagued Kentucky Lake Motor Speedway, in winning the 25-lap Crate Late Model feature Saturday night. Other winners on the program included Terry English in Late Model, Trent Young in Modified, Chad Boone in Stock Car and Mike Neighbors in Pure Stock. 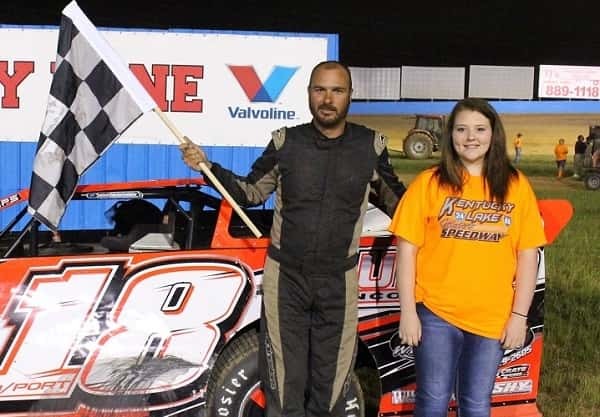 Davenport claimed the $2,500 first-place prize for his win, the third in as many starts this year at the KLMS oval for the Benton, Kentucky, driver. He also won on April 11 and April 18. The track has been idle since then, plagued by rain that washed out races on April 25, May 9 and May 15-16. May 2 was an open date. Davenport got the jump on Tanner English at the start and led all the way. He finished ahead of Ashley Newman, English, Evan Taylor and Ronnie Cooper. 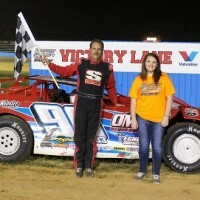 Terry English, also of Benton, Kentucky, got his second win of the year in the 15-lap Late Model main event. 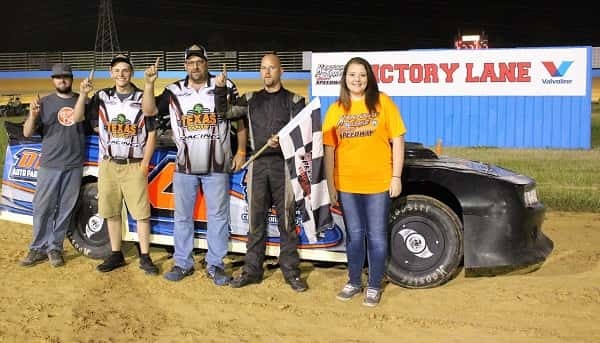 English, who won on opening night April 11, prevailed in a first-lap battle with Tim Brown and went on to win over Dylan Thompson, Jarryd Holshouser and Chris Shelton, with Brown fifth. Young, a six-time winner last season at KLMS, took his first win of this season in the Modified main. Michael Lee, Brian Shaw, Todd Riley and Michael Turner rounded out the top five. 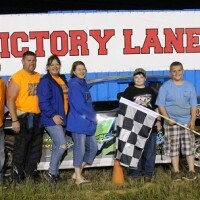 Boone won for the second time in a row in the Stock Car class, adding to his win April 18. Defending track champion Mike Lentz was second and Joe Hamm third. 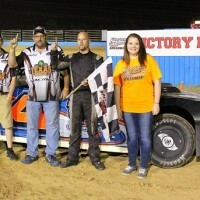 Neighbors became the third different winner in the Pure Stock division. Randy Swift and Matthew Rollins, who won the first two races, were second and third behind Neighbors. This Saturday’s program will feature the Late Model division in a $2,000-to-win main event, along with the Stock Cars ($1,000 to win) and Pure Stock ($700 to win). Crate and Modified races will also be on the program. Terry English takes the win in the 15-lap Late Model main event. Mike Neighbors takes the win in Pure Stock division. Chad Boone crossed in first in the Stock Car class.